MELISMATIC: NOW KPOPPING: Super Junior Keeps it "Simple"
NOW KPOPPING: Super Junior Keeps it "Simple"
Super Junior, South Korea's undisputed largest boy band, has never been my favorite of the KPOP genre, but they are a boyband, and usually that's reason enough for them to get happily "under my skin", (ahem) to quote another boy band, as of late. The addiction began thanks to their sub-group, the Mandarin singing Super Junior-M, which currently features six of Super Junior's original 13-member lineup, along with two extras in Chinese-Canadian Henry and Chinese Zhou Mi. The song, "Perfection", released earlier this year, was the debut of this new re-working of SuJu-M, after the drama-filled exit of the sub-group's leader, and former original Super Junior member, Chinese pop star Han Geng. I've already discussed my love for this cut, in all of its campy, eyeliner-adorned, random cravat-wearing glory, this past March. A few months ago, Super Junior in its large and non-sub group state, released their fifth full length album, Mr. Simple, via their label, SM Entertainment, the same conglomerate that gave us f(x), SHINee, BoA and...wait, for it...TVXQ! The group debuted in 2005 with 12 members before gaining a 13th a few months later in the sweet voiced young gun Kyuhyun, however, as of this second, in September 2011, the group currently stands with eight active members. Two, Kangin and Heechul, are currently serving their mandatory service in the South Korean military (with a third member, Leeteuk, scheduled to depart shortly as well). The aforementioned Han Geng has filed a lawsuit against SM for unfair practices (and has won), while the fourth, Kibum, has been M.I.A. since the promotional period of their third album, for reasons somewhat unknown other than to Super Junior themselves. The fifth, Siwon (aka the muscular, eye-candy serving, abs-baring member), is still a member of the group normally, but his time has been taken up filming an upcoming television drama. But enough of the backstory, let's try to keep this 'Simple', eh? The group is currently supporting their fifth album on the back of its lead single, "Mr. Simple", a bouncy, synthy cut about not letting stress get to you and just going out and having fun with your friends. I'm guessing this is something the SuJu boys know quite a bit about. It was written by Yoo Young-Jin, the Korean equivilant to Max Martin in having written such hits as TVXQ's "O" and "Mirotic", BoA's "Girls On Top", SHINee's "Ring Ding Dong" and "Lucifer" and previous SuJu hits "Don't Don", "Bonamana" and the worldwide phenomenon that was "Sorry Sorry". Check out the music video below, featuring now "inactive" Siwon (sings second) and armyman Heechul (with the glasses). Why is this Yesung (dark, messy bowl-cut hair with blue shirt, yellow rope) soulsung intro not also available as a interlude of some kind? I demand tribute! "BECAUSE I NAUGHTY, NAUGHTY" is the new "LOVERHOLIC, ROBOTRONIC". Deal with it. The running bits in the initial dance break. Shindong's "SuJu Ganda", which translates to "Super Junior's Coming" or "Super Junior, let's go". Dear Donghae, you may have become my #2 KPOP Bias out of literal nowhere, but that whole pointing and making a square(-ish) shape with your hands? Yeah, that's not a dance, dearie. Just stick with the pelvic thrusts. No one will complain. The chorus is hardly Super Junior's best group choreography -- a weeble wobble dance? Really, SM? -- and makes me weep for what could have been. "JUST GRAB IT! GRAB IT!" ...Dear ELF Fandom, I hope they don't know what they are actually saying. The Eunhyuk (the blonde)-centered dance break is the business. Because it's a Yoo Young-Jin jam, and because it follows Super Junior's usual aesthetic pioneered with "Sorry Sorry" back in 2009, it's very catchy. Whether or not it's another instant classic remains to be seen, as the benchmark for this year was already set very high with TVXQ (HoMin)'s one-two punch of "Why (Keep Your Head Down)"/"Before U Go" (that's not bias, people -- it's fact). "Mr. Simple" is one part "Sorry Sorry", one part "Bonamana", and one part SHINee's "Lucifer", but is that such a bad thing? It's certainly not something we haven't heard before, but with Super Junior, that's part of their charm -- their reliability, and their power on stage as a unit. The Mr. Simple album itself continues this thread of ironic "simplicity". With the exception of "Simple" and two other ace uptempos in "Opera" (completely manic and insane -- part of me wishes this was the lead single for the choreography fantasy alone) and "Be My Girl", the vast majority of the album exposes the Super Junior members age. All of them now span the ages of 22-29, and are willing to experiment with more adult musical genres rather than predictable idol fautter. A good example of this would be the funky, horn-blaring "Good Friends", an ode to the group's tight friendship since their trainee days back in the early 00's. Super Junior is often ridiculed for being a do-everything kind of group rather than strict musicians. I myself made this kind of distinction when first getting in to KPOP, as they seemed more like a variety act than a legitimate group of vocalists. Mr. Simple helps try to prove this wrong, with cuts like "Storm" and "Memories". "My Love, My Kiss My Heart" sparks nostalgia for early 00's Swede pop, and bouncy but breathy "Feels Good" never fails to put me in a good mood, never minding it's mild sexual undertones detailing a confrontation between two men who love the same girl. The R&B flavored "Y" was composed and written by one of the group's hearthrobs, Donghae, who deserves more credit for his clearly evolving musicianship skills. As in the past, much of the vocal brunt work is carried by the three main vocalists of the current usually 10-membered group -- husky voiced crooner Yesung (if I could marry that man's voice, I would, with no hesitation), higher tenor Ryeowook and more R&B-flavored Kyuhyun. Backup vocals are filled out by leader Leeteuk; Sungmin, who's sweet voice mimicks his cute image; visually ambiguous and generally strange in an endearing way Heechul; and the eye candy in Siwon and baby-faced Donghae (I CALL BIAS!). Rap parts are taken by adorably charismatic Shindong and "dance machine" Eunhyuk (and occasionally -- and rather adorably -- by Donghae). 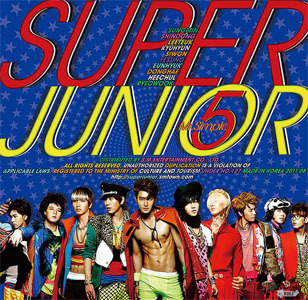 Recently, the album was "re-released", as is Korea's way, with the alternate cut and current "single", "Superman", another ode to Super Junior's strength, especially in their current period of member flux. Despite being not on the original cut of the album, "Superman" sounds starkly different from everything else in the KPOP landscape, relying on more masculine, intense barks and rap parts, set to a timely military feel. From the name of "Super Man"
To be sure, the album may not be quite up to expected standard in terms of all that Super Junior has accomplished, but as a now adult version of the Super Junior idols fangirls (and boys) around the world have come to love, it is a huge achievement. Featuring a plethora of genres and putting on proud display just how far the group has come from its debut days tackling a tacky cover of forgotton boyband Triple 8's "Knockout". It's not just my new-found love for the brothers Super when I say, this album should be given a chance. Best Cuts: "Opera", "Superman", "Feels Good", "Y", "Good Friends"
Pretty Darn Decent: "Walkin", "Mr. Simple", "Storm", "Be My Girl", "My Love, My Heart, My Kiss"
Btw, any word on the K-pop street as to when/if Kangin (and Heechul, whatever) will return? In a group with so many people, its a wonder they make any money period! I thought I was the only one who... really liked the album. I thought the uptempos were all decent, and the only songs that really went past me were 'Storm', 'Memories' and 'Feels Good'. I don't know, I thought this album was a definite improvement from Bonamana last year, not good enough for a last album, but a decent album nonetheless. I thought it covered up Super Junior's weaknesses really well, their weakness being the relative slack on vocals. Plus Opera is probably one of my favourite SJ songs ever. IS IT NOT THE BUSINESS OR WHAT?! btw Mel, I was wondering if you were going to blog about any of DBSK's Japanese releases thus far? I need to know I'm not the only one who digs Superstar. Anon - Glad you liked it too! :) SJ is difficult to quantify for me. There are so many members (even with those who are "indisposed" at the moment) and yet, you do "feel" it when just one isn't present. I think this album did a great job of presenting them in the best way possible, as well as providing them a great "bridge" to a more adult sound -- there is something for everyone here.